Dream Pod 9: Jovian Wars Joins Feedback Friday, HGB Week 2 Post & News! For our first Jovian Wars Feedback Friday (February 16th, 2018) no poll, we want your feedback on the Venus Faction Alpha Playtest V1.0 pdf released earlier this week. What you liked or didn't like and if you think we forgot anything that would have been nice to have for playtesting, let us know. Please help us with the Alpha Playtesting of the new Venus spaceships, exo-armor and fighter squads against the existing Jovian and/or CEGA forces you have. Trying forces of the same or nearly the same points and let us know the force used (faction, total points. and what it included) and who won the battle and by how much, Let us know if you think the Venus spaceships or squads are over or under pointed after a few playtests, all this will help us get the Venus forces better point balanced before they are officially added into Jovian Wars Beta Rules this summer. Our goal is to use all the Jovian Wars Rules Committee poll results and player feedback to make the final printed Jovian Wars Rulebook, that we plan to release in 2019, the best rules and most fun game possible. Click the link below to our first Jovian Wars Feedback Friday - login and leave your feedback and Venus Alpha Playtest results. For our first Heavy Gear Blitz Feedback Friday polls we had 29 players vote, which was a small sampling result. We had 79% vote that they did not like the January 2018 Update and about 76% vote that we should roll it back and release a pdf with the new Utopia & Peace models. So Dream Pod 9 will be rolling back the January 2018 Update to the previous July 2016 Update and making a pdf available next week with the new Utopia and Peace River models. But about 24% didn't want the January 2018 Update rolled back, so there are some elements of the update that players liked. We'll be doing a series of polls in the coming weeks to determine what we should change or not in the next Rules Update. One result that surprised us was the "Do you think the present Heavy Gear Blitz rules are bit to complicated for new players?" with about 59% voting No. Maybe our sampling was to small or most of the votes are from long time players that have adsorbed the all rules over time, we'll leave the polls open for now to continue getting more sampling. But we did get some great feedback on what players think we should do to make the existing rules easier to understand. From rewriting existing rule texts to make them clearer, to better rules examples, and arrangement of rules in the book so that when a rule is first referenced its given a quick explanation instead of referring the player to a section later in the book. All of this can be done, it will add to the length of the rulebook, but will make it easier for new and old players to understand. 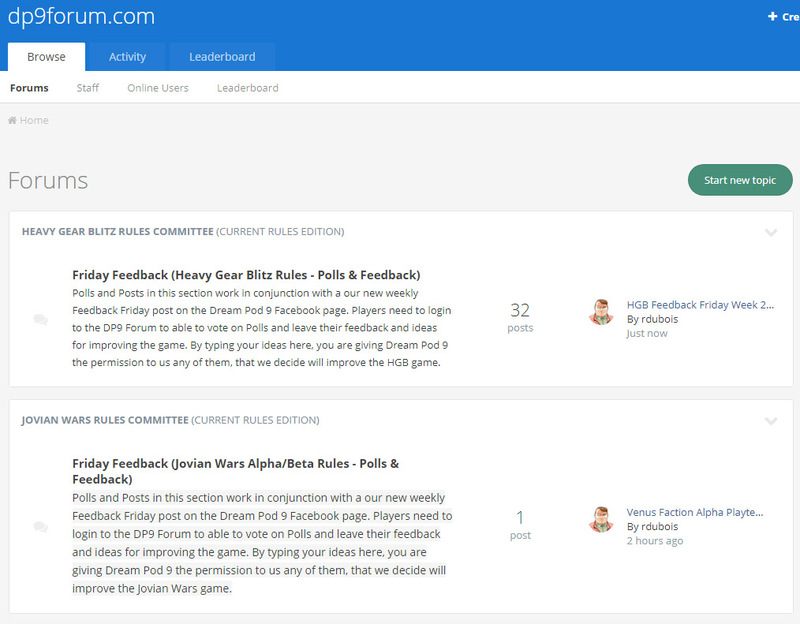 Feedback leads us to several new polls this week, about the rules and should aim for three levels of rules in the future a basic level that everyone uses with initiative, movement, attacks (direct, indirect, melee, forward observing), and intermediate level with stuff like fire and corrosive weapons added where you have to keep track of their effects, and an advanced level that adds Electronic Warfare and Stealth to the game. And would you like us to start layout on a few sample rulebook pages with the existing rules text and 1 or 2 examples plus add the quick rules explanations when a new rules is mentioned and show them to players for feedback in future Feedback Friday posts? Click the link below to our second HGB Feedback Friday Polls, login, vote, and leave your feedback. Dream Pod 9 News: Line Developer, Dave McLeod, is leaving DP9, we wish him well and thank him for all the hard work he has put in over the years on the Heavy Gear Blitz and Jovian Wars gamelines. In the short term Robert will be taking on his duties, working with the players on the new Rules Committees to improve the rules and will continue to do layout as before. We'll be looking for a few players that are knowledgeable about the rules to form the core of the Rules Committees and work with Robert on future updates for the games and to help answering online rules questions from players. Home › Blogs › Robert Dubois's blog › Jovian Wars Joins Feedback Friday, HGB Week 2 Post & News!